Frances Isbell looks on as personal care assistant Christy Robertson washes dishes and prepares food for her in Tuscaloosa, Ala., June 27, 2017. Isbell has spinal muscular atrophy and is finishing up law school at the University of Alabama. Optional benefits received by millions, many of them disabled, would be at risk under Republican proposals to repeal the Affordable Care Act. 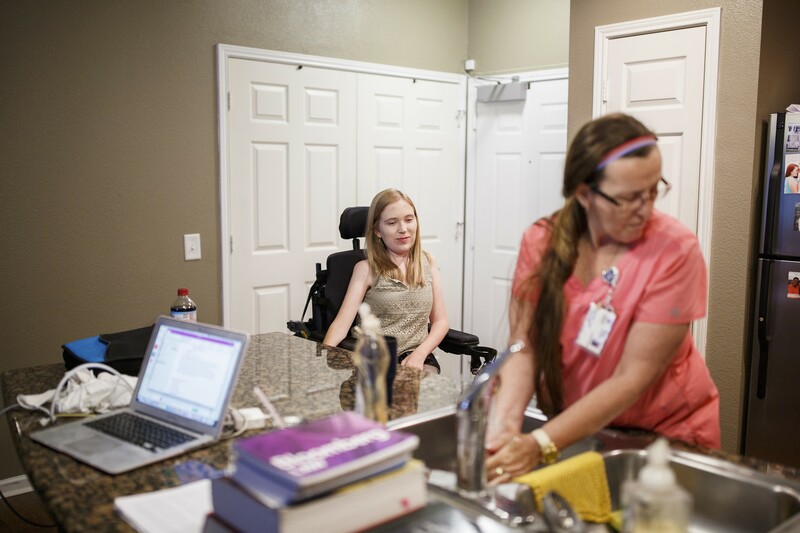 She hopes to become a disability rights lawyer — “I’d love to see her on the Supreme Court someday,” her aide, Christy Robertson, said, — but staying independent will be crucial to her professional future. The care she gets is an optional benefit under federal Medicaid law, which means each state can decide whether to offer it and how much to spend. Optional services that she and millions of other Medicaid beneficiaries receive would be particularly at risk under Republican proposals to scale back Medicaid as part of legislation to repeal and replace the Affordable Care Act. Those services include dental care for adults, long-term care for disabled and elderly people living at home, certain therapies that children with disabilities receive in school, prosthetic limbs and even prescription drugs. The battle over replacing the Affordable Care Act has focused intensely on the future of Medicaid, the state-federal health insurance program for the poor and vulnerable. But the House and Senate bills would also make profound changes to the nature of Medicaid, shifting it from an open-ended entitlement to a program with strict federal funding limits. Those changes would have far bigger consequences over time, affecting many more of the roughly 74 million Americans on Medicaid. The threat to optional services may be especially acute in states, like Alabama, that already spend far less than the national average on Medicaid and are averse to raising more revenue through taxes. The drain on Medicaid funding would worsen over time under the bill that Senate Republicans are working to pass, with the new funding limits starting in 2021 and having the biggest impact more than a decade from now. The nonpartisan Congressional Budget Office estimated that Medicaid spending would be 26 percent lower under the Senate plan than it would be under current law in 2026 — and 35 percent lower in 2036. Under the Senate plan, states would receive a fixed annual amount for each Medicaid beneficiary, with each category of beneficiaries, like children and the disabled, getting a different base amount based on recent costs. The amount would increase every year by a formula that is expected to grow more slowly than average medical costs after 2025. Disabled children would not be subject to the spending caps. Conservatives say Medicaid spending, which consumes a major and growing portion of the federal and states’ budgets, needs to be reined in. The current system of unlimited federal matching funds, they say, has encouraged states to milk as much as they can, sometimes wastefully.